The Nickel Sweden Warikomi Damascus knives feature a Swedish steel core with 44 layers of nickel Damascus and stainless - 22 layers on each side (11 layers of nickel with 6 layers of SUS410 and 5 layers of J1 stainless steel). The center core is a Swedish steel cutting edge. They contain a high nickel content for a superior shine and corrosion resistance. 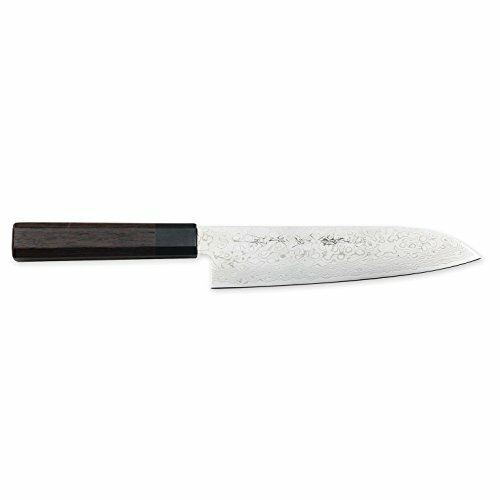 Rose-wood handle with Japanese Ebony wood guard makes NSWD appealing to culinary pros as well as experienced home chefs. No rivet is used for this traditional Japanese handle. Birds-eye patterning on the blade, octagonal handle and buffalo horn ferrule make this a real showpiece knife. If you have any questions about this product by Kikuichi, contact us by completing and submitting the form below. If you are looking for a specif part number, please include it with your message.